Jagram Monaco Canopy: The Jagram Monaco Canopy is a 2.8 by 2.8 metre wooden canopy with a choice of black or green bitumen shingle tiles. An elegantly designed garden structure, the Monaco is available with the option of a floor and balustrade with hand rail. The canopy is expertly crafted from Northern European Softwood, responsibly sourced from properly managed forests, and pressure impregnated with Jagram's advanced formula wood preservative. This pressure treated wood is guaranteed for ten years against decay, insect attack, and weathering. The high quality of craftspersonship displayed in the Monaco Canopy can be seen in its wooden finial, carved balustrade, vaulted ceiling, and curved support pieces. 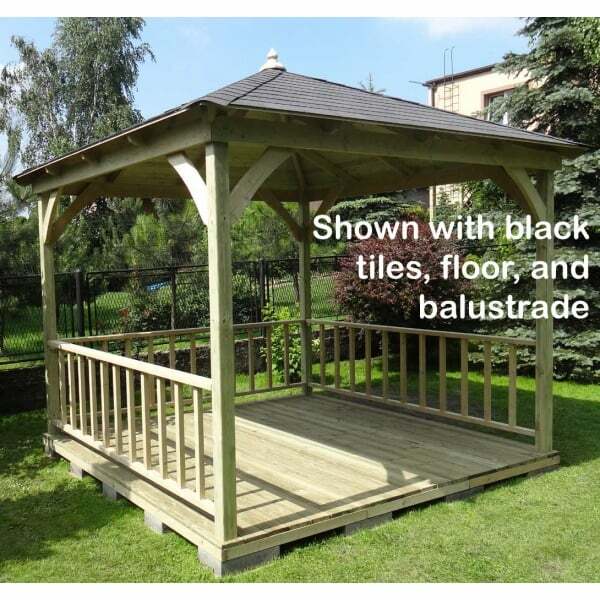 A sturdy and beautifully crafted garden feature, the Jagram Monaco wooden canopy is sure to add value to any garden and to be a comfortable and attractive space for relaxing or entertaining for many years to come. The Monaco is delivered promptly with all required components, fixings, and instructions for straightforward home assembly.